Running Press Adult, 9780762457267, 296pp. ENTERTAIN WITH STYLE AND FRESHNESS! André Darlington has been writing about the cocktail revolution from a front-row barstool for over a decade. He is a long-time contributor to Madison, WI's alternative weekly, Isthmus, where he has been an award-winning restaurant critic and cocktail columnist. He is a frequent wine and spirits judge in the U. S. and Europe, and, when he encounters a well-stocked bar, cannot resist getting behind the stick. Tenaya Darlington is a food writer and educator in Philadelphia. By day, she teaches writing at Saint Joseph's University; by night she pens the cheese blog Madame Fromage (madamefromageblog.com). Her book, The Di Bruno Bros. House of Cheese, may be the first cheese guide to suggest pairing cheese with cocktails. Her writing has also appeared in Cooking Light, Global Traveler, and the Philadelphia Inquirer. 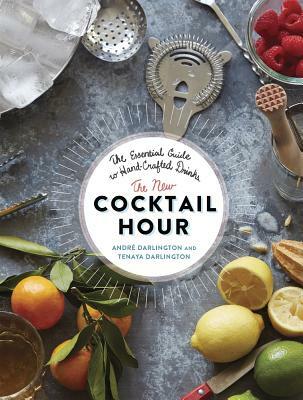 André and Tenaya are co-authors of the cocktail blog With the Darlingtons. .
"Individuality is part of this book's charm, much like its ode to an underappreciated ingredient, Dubonnet. The greater success of The New Cocktail Hour is its ability to be many things to a variety of readers and still stand out from the pile of cocktail copycats as both useful and different." "The New Cocktail Hour can help you choose a drink with confidence.... Elevate your craft with DIY bitters, the right tools and glassware, no-fail cocktail ratios and the art of the garnish, all explained in this latest cocktail book. It may be new, but it is destined to be a classic." "The lavishly photographed book is quite the entertaining read, but its smaller format means that it belongs on the shelf with your liquor, not on the coffee table. As a witty guide to the history and practice of making great cocktails, The New Cocktail Hour is a great addition to the canon of spirits writing."